The area around Preuilly sur Claise, known as the Touraine de Sud, does not feature in many English language guidebooks. This is a real pity, as the area has a lot to offer the traveller, from Royal Chateaux to farm made produce - and everything in-between. If you have enjoyed reading our blog and want to visit the area, we hope the following links may be a help. 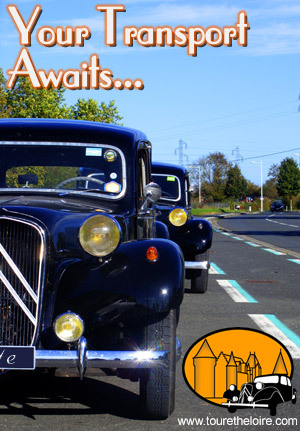 Loire Valley Time Travel offers one and two day tours of the beautiful Loire Valley in a classic 1953 Citroën Traction Avant. When you are in the Loire Valley take a trip in Célestine and explore some of the lesser known parts of the "Garden of France". Tourist Office of Tours. Situated opposite the Tours train and bus stations. Tourist information for the Touraine and Loire Valley as well as for the city of Tours. Les Limornières. Alex and Nicole Crawford welcome you to their 19th century family holiday farm cottages arranged around south facing courtyard garden, dining barn, and indoor and outdoor games. Surrounded by Loire Valley countryside, woods and fields yet only 3km from historic le Grand Pressigny. Château Valcreuse A 19th Century château near la Roche Posay. Elegant and quiet with a wonderfully hospitable atmosphere. La Confiance. Chris would like to welcome you to La Confiance at Champ d’oeuf, his delightful Chambre d’hote and self catering Gite in the South Loire region of France, in the Brenne Natural Parc. l'Image. A traditional hotel set on the Marketplace in Preuilly sur Claise. A lovely family run establishment with a really good restaurant and four spotlessly clean bedrooms. Domaine de la Tortinière: A fairytale Neo-renaissance family run chateau hotel set in magnificent grounds on the outskirts of Tours. La Maison Jules: The thoroughly delightful Alexandra runs a luxury B&B in a fully restored grand town house in the centre of Tours. The bathrooms are huge! Easy walking distance from Tours station, even with luggage. Fluent English is spoken in all these accommodation establishments. Lunch or dinner? We recommend eating out at lunchtime rather than dinner. It will be better value and a more authentic experience. During the week lunch is strictly 12.00 - 14.00 and dinner 19.00 - 22.00. Restaurants will be closed between services. Note that many restaurants are closed Sunday evenings and all day Monday. Menu? We recommend going with the set menu of the day. It will be what's fresh, what the chef wants to prepare that day and most people will have it. Set fixed price daily changing limited choice menus such as are standard at lunchtime here will be called either le menu or la formule. La carte is the term for the full menu if you want to choose à la carte. Wine? The house wines in all of the establishments listed below are good quality and value. Order them by the picher (250ml or 500ml, which in French is vingt-cinq centilitres or cinqante centilitres) or sometimes by the glass. If you want sparkling wine please choose a local wine such as a Vouvray or Montlouis rather than champagne. The local wine will be better quality and cheaper. Restaurants are not BYO. Aperitif? You are quite likely to be asked if you want an aperitif at the beginning of the meal. Most local diners don't at lunchtime, but some do in the evening. The most popular aperitif is kir (a fruit liqueur in white wine) or kir royal (a fruit liqueur in sparkling wine). Traditionally the liqueur is cassis (blackcurrant) but other flavours (peach/pêche, raspberry/framboise) are now popular and you will be asked what you want. Bread and water? Bread and tap water will be put on the table without you asking. The tap water is excellent, so there is no need to order bottled water. Coffee? If you want a coffee other than an espresso at the end of the meal you need to be precise when you order. Un café = an espresso in a small cup; un café allongé = an espresso with added hot water (no milk) in a cup; un café grand crême = an espresso with added milk (can be hot or cold, depending on the establishment) or un café au lait = an espresso with added hot milk in a cup; un café noisette = an espresso with a dash of cold milk in a small cup. The terms latte and americano will probably not be understood, and they won't be able to do filter coffee. Many places don't do cappucino. Coffee is served after the meal, not with dessert. Everywhere will have decaf and a selection of teas. Juices and sodas? All juices, including orange, will be processed, not freshly squeezed. We recommend locally produced apple juice if the establishment has it (small scale production, often organic). The range of sodas will be limited. Establishments will have Coke Zero or Coke Lite but not both. Schweppes is tonic water and agrum' is Schweppes citrus flavoured soda. Dry ginger ale is completely unknown. Lemonade is fizzy and not terribly lemony. If you want a still lemon drink ask for a citron pressé. Cheese? Cheese is served before dessert, but not all restaurants offer it. The Bill/Check? The wait staff will not bring the bill unless you ask for it. Normal practice is not to ask for the bill but simply get up and go to the checkout when you want to pay and leave. Cutlery? At many restaurants you use the same cutlery for starter, main and cheese at lunchtime. Simply put them on the table when you finish each course. If you don't the waiter will. Condiments? Salt and pepper may or may not be on the table. It's rare for local diners to use them. They will often use mustard though if it is there. Reservations? Are appreciated but can be made as late as a few hours before you intend to dine. Which Restaurant? More or less any. You would have to be unlucky to get a truly bad meal in the Touraine Loire Valley, even if the restaurant looks unpromising from the outside. Most restaurants use fresh local produce and rely on local trade. Below are our recommendations, in no particular order. Traditional Tourangelle cuisine, often using home grown vegetables. Relaxed and friendly service, the staff speak English. Budget between €12 and €20 for lunch, and €20 - €40 for the dinner menu. Our local Michelin Starred restaurant. A special place for a special night out, with friendly and unintimidating service. Plan on spending at least €40 per person, plus wine. English spoken. Stylish but very affordable restaurant in the town of Loches. The weekday lunchtime 3 course set menu is €14.90 (no choices), including a glass of wine. English spoken, friendly professional service. Reservations recommended for market days (Wednesday), weekends and holidays. 18 route départmentale 952, 37210 Vouvray. Tel: 02 47 52 70 18. Uninspiring exterior but the food and value is good. Lunchtime 3 course set menu €14.90. 20 Avenue de la gare, 41400 Montrichard. Tel: 02 54 32 04 36. A real workmans café, with impressive self service buffet starter, generous traditional 'homestyle' main (daily changing limited choice), excellent cheese board and dessert trolley. The lunchtime 4 course set menu is €13.50. No need to reserve. 4 Avenue Léon Berthier, 37290 Preuilly sur Claise. Tel: 02 47 92 08 50. The chef had a Michelin star at his previous establishment, and this restaurant is extremely popular amongst locals and visitors alike. The lunchtime 3 course set menu is €12 (no choices, includes red wine). Reservations essential. 2 Place du 8 mai, 37600 Saint Flovier. Tel: 02 47 94 72 24. A workmans café that is a cut above. The food is traditional but with a creative edge that makes it a little bit more special. The lunchtime 3 course set menu is €11.90. 19 rue Balzac, 37190 Azay le Rideau. Tel: 02 47 45 30 36. A small restaurant with a limited choice set menu situated right by the gates of the chateau in Azay le Rideau. The food is delicious and creative, always seasonal and made from fresh local produce. The welcome is relaxed and friendly. English is spoken. Lunchtime 3 courses €23. 1 rue du Vaussouvin, 37190 Valleres. Tel: 02 47 45 41 19. Situated on the side of the road, not in a village, between Azay le Rideau and Villandry. The food is a fusion of French and oriental, creative, interesting and very tasty. Fresh produce from a local organic farm is used. Whoever chooses the background music has excellent taste! Service is slow, partly because everything is freshly prepared. Lunchtime 3 course set menu €16. 2 rue du lavoir, 37310 Chédigny. Tel: 02 47 92 20 29. Situated in the middle of a truly picturesque village with climbing roses on every house, the restaurant is in a beautifully restored old building with a wisteria covered terrace. The chef rarely repeats herself, so every visit is different, and always excellent. The lunchtime 3 course set menu is €15 + wine + coffee. 22 boulevard Carnot, 41700 Cour-Cheverny. Tel: 02 54 46 23 82. In a spacious modern building with offstreet parking, this restaurant is exceptionally good value. Stylishly presented dishes with a twist on local traditions. The weekday lunchtime 3 course formule is €16. Budget €40-€50 for two people if you have the formule, wine and coffee. 34 route Nationale, 41700 Cour-Cheverny. Tel: 02 54 79 80 08. In the heart of the village and slightly tricky to get to because of the one way system through the centre. We are amused that the building looks older now in terms of architectural style than it did 50 years ago (check out the collection of photos of the exterior, which show the building being progressively oldified). Despite its touristiquely quaint appearance this is a genuine workers' restaurant, with generous simple traditional food. Weekday set menu €13. 1-3 route du Val d'Indrois, 37310 Azay sur Indre. Tel: 02 47 92 77 16. Friendly atmosphere and simple food. Sit outside under the linden trees if you can. Although a genuine French relais (truck stop) style restaurant which provides good inexpensive meals to workers and those travelling through it has become a firm favourite with the local anglophones. The weekday set menu is €14 and includes wine. Another really genuine workers' restaurant, with a buffet of salads for starters and another for desserts. Serving simple, generous, traditional food from a modern building set in a parade of shops on the main road through town. Often packed with workmen having lunch and the carpark full of white vans (always a good sign). 3 course lunchtime formule €16 (includes wine). filvert. The subsidised bus network for the Touraine, based in Tours. All single journey fares for the general public are €2.10. SNCF. The French national rail company will bring you to the Touraine from Paris in an hour.